84 Inch Hopper Broom Rental Attachments – Sweepster, is available for rent in Rochester NY, Ithaca NY and the entire Western New York region. 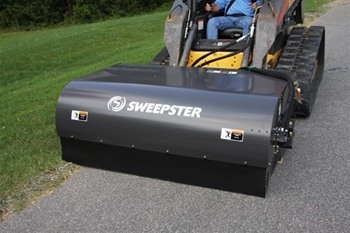 This 84 inch, hopper broom attachment is manufactured by Sweepster, is specifically created for skid-steer loaders and is equipped with quick change capabilities. The broom sweeps in multi-directions for maximum productivity – straight: to pick-up dirt, and backwards to pick-up construction debris, gravel, rock, asphalt and other materials.